In 4-quart saucepan, place potatoes. Add water just to cover. Heat to boiling; reduce heat to low. Simmer covered, 25 to 30 minutes or until tender. Drain; cool slightly. Cut into slices. Meanwhile, in 12-inch nonstick skillet, cook bacon over medium heat until crisp. Drain on paper towels. Chop bacon; set aside. Remove and discard bacon drippings from skillet. Add oil; heat over medium heat. Add onions; cook 3 to 4 minutes, stirring frequently, until tender. Stir in flour, sugar, salt, celery seed and pepper. Gradually stir in water, vinegar and mustard. Cook over medium heat 2 to 3 minutes, stirring constantly, until bubbly and thickened. 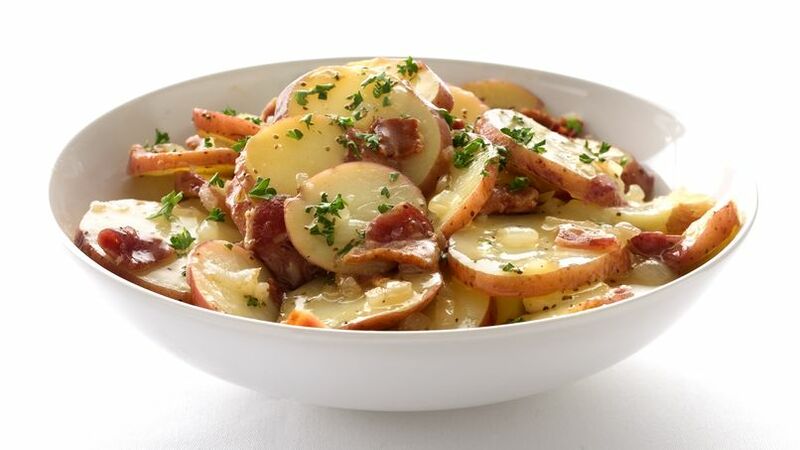 Stir in potatoes and bacon. Cook, stirring frequently, until thoroughly heated. To serve, sprinkle with parsley.